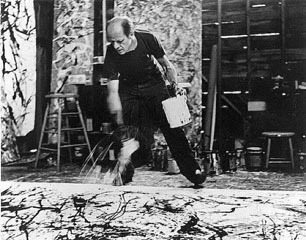 One of the most interesting artists of the last century is the American artist Jackson Pollock. Since we're just entering the Spring season properly, and one of Pollock's most famous periods was named the Springs period, it only seemed appropriate that we stop to take a look at him and his work in this edition of the Artist Spotlight. 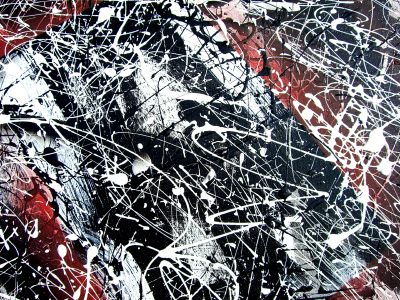 Even though we normally look at artists who are currently active, and Pollock passed away back in the mid-1950's, his influence on modern art is undeniable. As a pioneer of the abstract expressionist school, Pollock is incredibly famous for the unique style of his artwork, commonly known as 'drip painting'. If you've ever seen a single Pollock, the reason for the name will be immediately apparent. The entire style is characterized by spatters and droplets, thrown against the canvas with a wild abandon. The Springs period we mentioned earlier was the time in his career when he established himself as an artist to watch, creating some of his most famous works in the converted studio of his home in the neighbourhood of Springs, in East Hampton, Long Island. Interestingly, as he was being lauded for his work in the style, as Life magazine featured him in a four page spread that asked the question, "Is he the greatest living painter in the United States?" he abruptly decided to change his style, and completely distanced himself from the drip painting style he is so famous for. "Pollock’s finest paintings… reveal that his all-over line does not give rise to positive or negative areas: we are not made to feel that one part of the canvas demands to be read as figure, whether abstract or representational, against another part of the canvas read as ground. There is not inside or outside to Pollock’s line or the space through which it moves…. Pollock has managed to free line not only from its function of representing objects in the world, but also from its task of describing or bounding shapes or figures, whether abstract or representational, on the surface of the canvas."